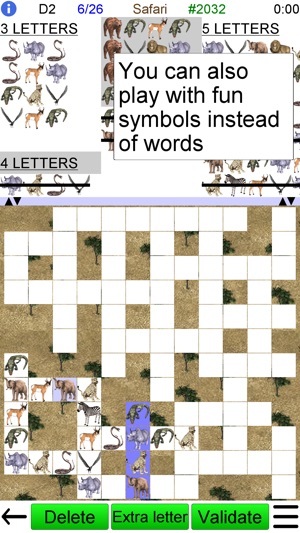 Fit words into a grid in this popular game, often seen in puzzle magazines. The grid looks like a crossword, but there are no normal clues. 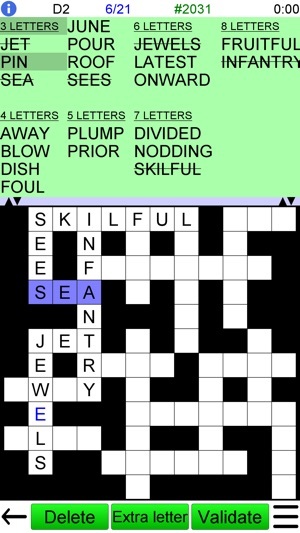 Instead you must find the right place in the grid for each word from a given list. The game has an easy to use interface. 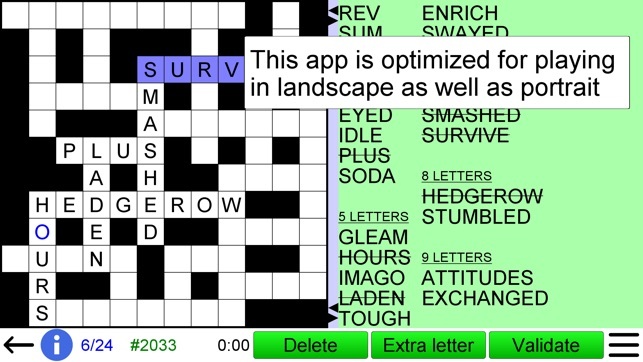 Either drag-and-drop the words to their correct position, or tap the grid and then the word. 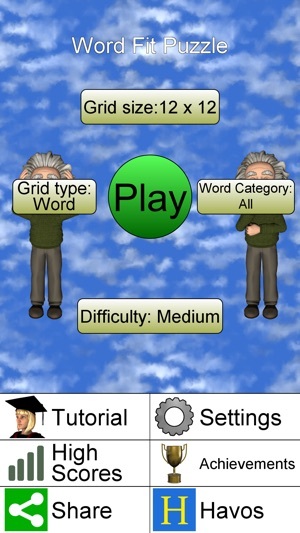 Play with an English word list or choose one of 25 other languages. 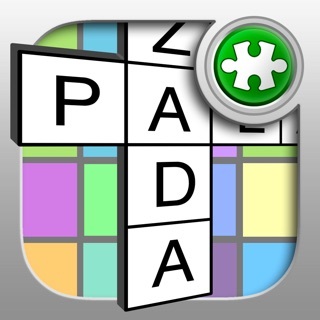 • Play an unlimited number of different puzzles!! • Multiple difficulty options. Start with easy puzzles. Then change the settings to play more challenging puzzles. Specify exactly how many columns and rows to use (from 3 to 20). Even non square grids (e.g. 12x15) are possible. Choose how much screen space for the grid and how much for the word list, using our unique movable split bar. This helps avoid searching for many small words (a common problem in word apps). 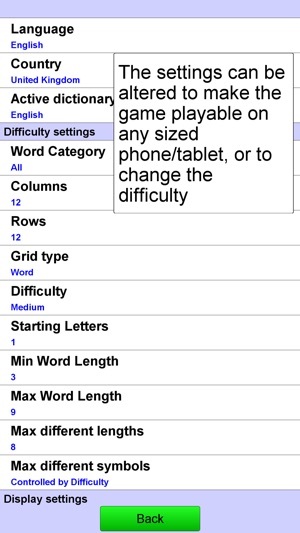 Also useful for specifying really difficult games (e.g. set both minimum and maximum word length to three). 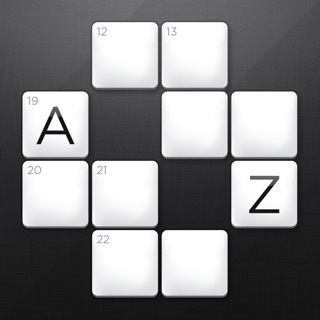 The game can start with one or more letters already placed in the grid, in order to help you get started. Choose the language of the word list, from a large range of downloadable dictionaries. 26 languages are currently available (see below). Can be played in portrait or landscape mode. Just rotate your device and the display adjusts automatically. 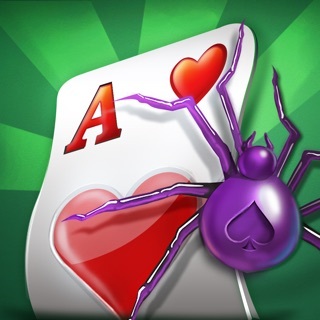 This app gives you the ultimate power to play the game just the way you want. Each game is assigned a difficulty level from 0 (easy) to 9 (very hard). The difficulty level is determined by the settings. Each difficulty level maintains the high scores (measured by fastest time to complete the game). The game displays the best 20 scores for each difficulty level. 1) View the definition of the word from an online source (e.g. 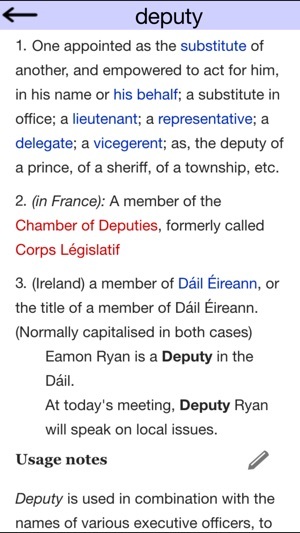 Wiktionary), optimized for viewing on a small screen. 2) When you play with a word list in a foreign language, the word definition will (where possible) be in your own language. This is great for language learning! Very fun game! Love free apps, would pay $.99 for it though. Is challenging, have always loved this kind puzzle. Doesn't get old for me, has different settings than just words and numbers to make it interesting!! This a great game to play. 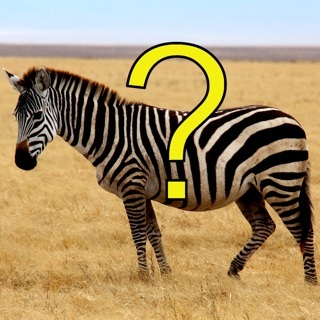 It was simple to figure out and I am game challenged when it comes to games. I am very happy with and I give this my highest rating. Down load it and see for yourself how much fun it is.